In April, Oak Leaf Studio reopens after it’s Winter hiatus with new paintings in acrylic and pastel by artist Leif Trygg. 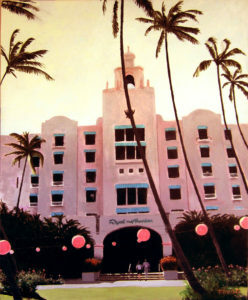 Featured are four new paintings including Honeymoon Hotel, an acrylic influenced by Trygg’s interest in architectural landscapes. And, Late Snow on Oak Street showing an Ashland neighborhood following a late Winter snowstorm. Prints and cards of Trygg’s new art and selected previous works will also be available. Oak Leaf Studio is open from 5-8 for First Friday on April 6th.